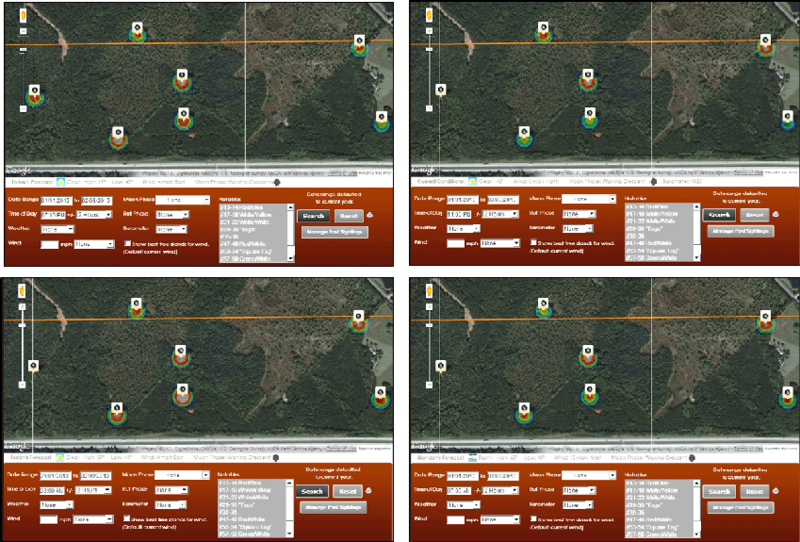 Big Game Logic (BGL) was originally created to help hunters to pattern deer using field observations and trail camera data. 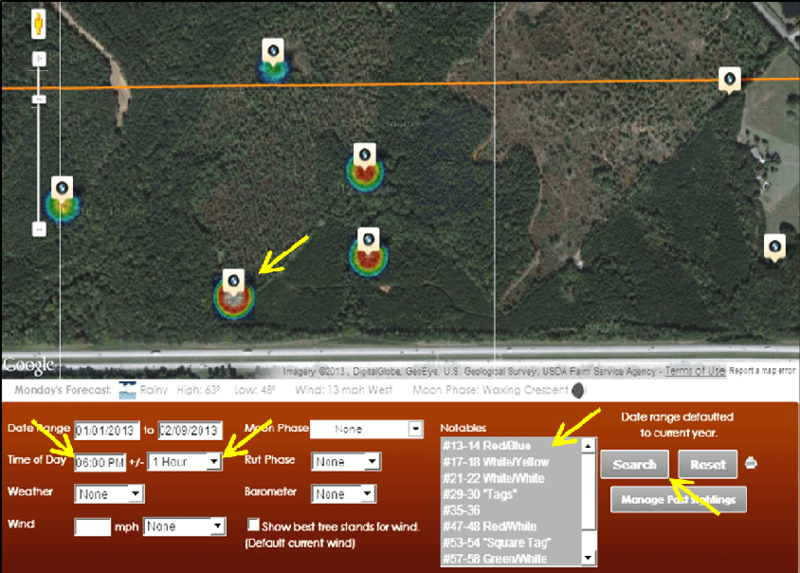 Throughout the process of patterning “Notable” deer for my graduate research, we have been adding trail camera data to our BGL camp map. We do not record data from every picture; rather we only record data from pictures of deer with collars and/or ear tags. If the same deer is in a series of pictures, we only enter data from the first picture in the series because we only want know the time the deer first appeared at the darting site. Our cameras are on a 5 minute time delay and we only take 1 picture per trigger event. Since sorting through pictures and entering data can be a tedious process, I also printed some data sheets so I can record the information I need, and enter it into the camp map at my own convenience (Table 1). 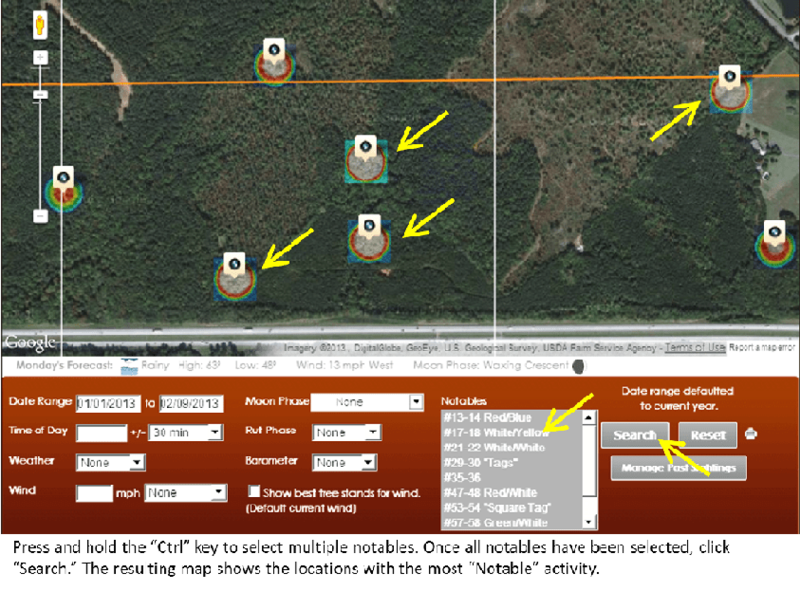 Once you have a decent amount of data entered into your camp map, the search tools become increasingly valuable and can be used to answer some interesting questions. Take a look at the series of questions below, and note how I used the search tools to answer them. 1.Which darting sites have the most “Notable” deer activity? 2.Which darting sites do “Notable” deer visit most from 5pm-7pm? 3.Which 4 hour time period are “Notable” deer most active at darting sites? Quick Update: Although we have not yet connected with any of our “Notable” deer, I had deer #17/18 within 15 yards and almost got a shot off. About 5 minutes before #17/18 arrived, a flock of 12 turkeys (9 long-beards and 3 jakes) showed up at the bait pile and for about 15 minutes the action in front of me was complete chaos. With turkeys chasing each other and putting the deer on edge, #17/18 didn’t remain still long enough for me to get a shot. However, I did dart one of the other deer in the group that #17/18 was traveling with that evening, so it wasn’t a total loss.